Our windows are made of maintenance free vinyl, and they carry a lifetime warranty. They are all equipped with Low E and Argon gas, which will keep you cooler in the summer and will help lower your heating costs in the winter. Canada Windows & Doors makes continuous improvements in their manufacturing process to offer the absolute best quality in window manufacturing available. All of our employees are factory trained by our equipment suppliers to produce consistent quality in all our window designs – that’s why we offer a 50 year warranty. Canada Windows & Doors offer one of the industry’s most complete and longest warranties in the industry. For a copy of our warranty, just click on the thumbnail and it will download automatically. All of our windows meet or exceed local building codes! As all window manufacturers should, we have researched and designed our windows to meet or in most cases, exceed local building codes – so you will never be surprised to see a local building inspector put your renovation on hold. Your entry doors are the most energy inefficient opening of your home. A new entry door from Canada Windows & Doors will improve the energy efficiency and at the same time add a significant style enhancement to your home. PVC windows from Canada Windows & Doors are available in standard white and Sandalwood. If you like more vibrant colors, look no further, we have our own custom painting line that can offer an almost unlimited selection of colors. Our exclusive Structural Clip (patent pending) made of durable nylon, will greatly increase the structural strength of our windows. In the closed sash position, the Structural Clip locks the main frame and will support the sash under heavy wind loads. In the open position, it automatically disengages from the frame. The clip is only visible when you tilt the sash for cleaning. The Patented Drain Channel with proprietary matching child proof latches provides for an exceptionally clean appearance and high resistance to water infiltration. Canada Windows & Doors has developed one of the most durable and energy efficient windows in the industry. Available in standard white and Sandstone maintenance-free PVC, and a host of decorator grill options available. Other custom colors are available. Casement windows are the most energy-efficient style of operating windows. Adorn Home Improvements gets their windows direct from a leading Canadian manufacturer, which have a patented hidden drainage to eliminate water infiltration. Awning windows are casement turned at 90°, so they crank open from the bottom up, which is ideal for open windows and keeping the rain out. 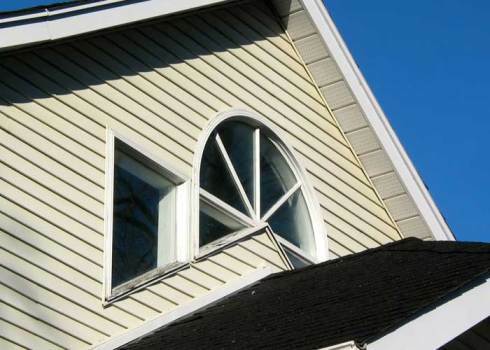 Canada Windows & Doors offers an unlimited choice of custom bow and bay window designs. You can have all windows fixed or your choice of operating windows. Add some style and grace to your home with an architecturally designed window or custom shaped window. We can produce any custom size or shape out of maintenance – free PVC with construction. Our custom-manufactured windows are available in standard sizes from 24 x 24” to 52 x 24”, and custom sizes are available within 24 hours. They are structurally designed and tested to support brick veneer up to 36” in width, have a galvanized steel C-channel, and have a 7 7/8” depth to fit into 8” concrete forms. To maximize air flow they feature a full width screen. If you want to match your existing window design, or you simply prefer single or double hung windows, Canada Windows & Doors can manufacture them in any size or color you desire – maintenance free and for easy cleaning from inside the home. If you prefer slider windows, Canada Windows & Doors manufactures one of the most easy to operate and energy efficient slider windows in the industry. Maintenance – free, any size and easy removal for cleaning from inside the home. Canada Windows & Doors offers an unlimited selection of picture window designs to enhance the beauty of your home. Just give us your wishes and our designers will present you with the most breath-taking designs.